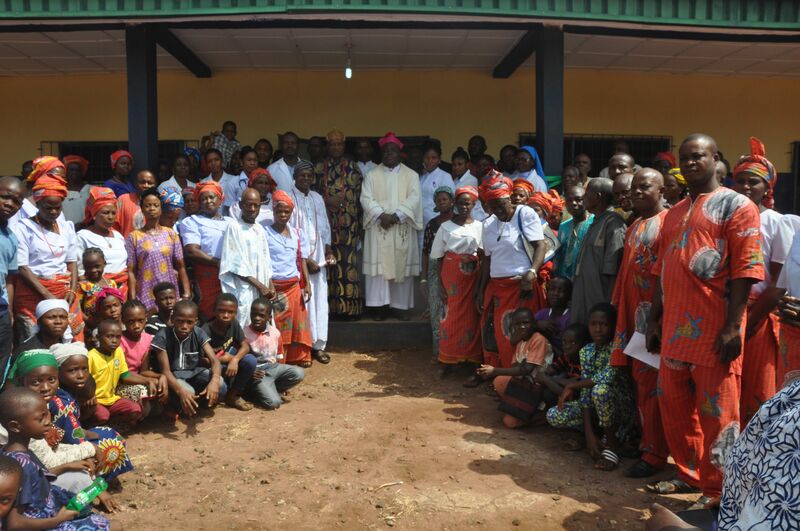 History was made in Ebelle community in Igueben Local government Area of Edo State on Monday, 17 December 2018 as the management of St. Camillus Hospital, Ebelle Annex which has been upgraded to the status of an autonomous hospital was transferred to the Sisters of Notre Dame de Namur by the Proprietor, Most Rev. Donatus Ogun, the Bishop of the Diocese of Uromi. The hospital was renamed Our Lady Health of the Sick Hospital by the Bishop. The hospital can also be called Our Lady’s Hospital, which is the shorter form of the new name. In renaming this Hospital “Our Lady Health of the Sick Hospital”, the Bishop of the Diocese of Uromi and Proprietor of the Hospital has placed the Hospital, its personnel and all those who will be attended to by it under the patronage of Mary the Mother of Jesus whom the Church invokes as health of the sick because of her role in mediating with her son for the restoration of the health of those who are sick. Staff. 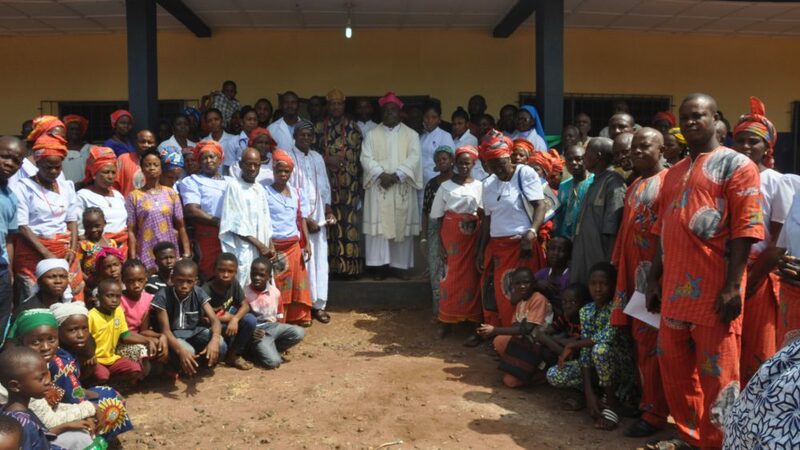 In his address, the Bishop thanked the Onojie of Ebelle, His Royal Highness, Zaiki Aikpaojie I, the priests, consecrated persons and the lay faithful for gracing the event. He asserted that the intention of the Diocese in upgrading the Hospital and entrusting its management to the Sisters of Notre Dame de Namur who are very competent in hospital management was to use the health facility to contribute to the promotion of evangelization in Esanland. He added that hospital apostolate is part of the healing ministry that the Church engages in. The hospital will cater for people in Ebelle community as well as those in Igueben, Ebudin, Ogwa, Ewossa, Ekpon etc. In addition to the services they render in the hospital, the sisters and other personnel of the hospital will also be embarking on outreach in the communities. They will go to different places to attend to the people so as to bring health care nearer to them. The Bishop charged the members of Ebelle community to see the hospital as theirs, to watch over the hospital and protect it. Having appreciated the Sisters of Notre Dame de Namur for the sacrifice they are making to be at the service of the people, he officially handed the keys of the hospital to Sr. Ngozi Duru, SND, who received them on behalf of the Leadership Team of the Sisters. Sr Ngozi thanked the Bishop and expressed their joy in receiving the hospital for the purpose of effective management. She assured all of quality health care to the people adding that the hospital was entrusted to capable hands. Present at the commissioning and blessing of the new hospital were the Onojie of Ebelle, His Royal Highness, Zaiki Aikpaojie I, the Vicar General of Uromi Diocese, Very Rev. Fr. Francis Omonlumen, the Dean of Igueben Deanery, Very Rev. Fr. Francis Okha, the Health Coordinator, Uromi Diocese and Administrator of St. Camillus Hospital Uromi, Rev. Fr. Julius Ekoh, the Parish Priest of Christ the King Catholic Church, Ebelle, Rev. Fr. Peter Ebalunegbeifo, the Vicar for Religious, Uromi Diocese, Very Rev. Fr. Wisdom Obiajunwa, SDV, the Director of Communications, Uromi Diocese, Rev. Fr. Leonard Elomien, the Secretary to the Bishop of Uromi Diocese, Rev. Fr. Gregory Abuya, Consecrated Persons of various religious congregations from across the Diocese of Uromi and beyond and the esteemed parishioners and citizens of Ebelle community.